The development of the child depends on a large extent as to how they are brought up – what are the circumstances, where they are staying and how are they treated. Such experiences make drastic changes in the behavior of the child. In the present modern world – in order to make both ends meet both the parents have to earn; hence most of the times they are not able to take care of their children. In order to ease the tension and anxiety of the working parents there are many options available now as compared to the previous times. There are many professional childcare centers which provide the services of looking after the child and also make sure that they become good people as they grow up. Why Choose Childcare at Workplace? The working parents need to ensure that their child is taken care of – in case the child is kept at the childcare at the workplace – it gives them easy access to meet them and take care of them. The company provides these services at their cost – because they believe that the employees who work stress free are highly motivated and put up their best performances. When a company offers the facility of childcare it makes the employee feel that they are valuable assets to the company. They can work without any tension about the children. Since the childcare is in the workplace itself they can meet their children as and when required. All of us prefer better convenience at work – we always wish that we can take care of our families even while we are at our workplace. Having a childcare at your workplace makes a major difference. The parents have the flexibility of continuing with their career and at the same take active part in the growth of their children. In the present modern world, career comes first – it is important to earn in order to meet both ends. In case of a small family most of the couples work and this is required to lead a reasonably good life. In the recent times the companies have noticed that many employees are not ready to take up full time jobs since they need to take care of their children – looking to such situation the latest in the trend is the workplace childcare facilities. There are both advantages and disadvantages to this facility – let us understand few of them. Childcare is the new buzzword in the corporate world. This is a benefit which is utilized by most of the couples who work in order to lead a better life. This is a benefit which has changed the corporate world a lot. The company can be rest assured that they shall never have to lose the best employee of theirs. The additional benefit of having the childcare at workplace is that the employee gets the chance to see their children during break hours and it also gives the child a feeling of a close knit family which may not be possible otherwise. In the present modern scenario when the company has to hire new employees, in most cases the management is in a dilemma where they are supposed to provide the childcare facility to the employees. The latest trend is to get a childcare centre mobilized in the office campus. The company spends a certain amount of money in order to make the employees happy. This is an extra advantage which is available for the new employees. The companies which provide such facilities are highly rated and preferred by the employees. The main reason being the employees can be with their children. They perform better and this is a win-win situation for the management. In the long run, the company considers this benefit provided to the employees as a business expense. It is a deductible expense – this is done so that they can provide appropriate budget every year. In the initial stages it may make losses but over a period of time with the contribution of both employee and employer the break even can be achieved. The employees initially do not have to bear any cost for the child care. All the benefits are provided by the companies because they understand that it takes time for the employee to settle down in the job. It is only after a certain period of time, certain amount is decided by the mutual understanding between the employer and employee. With the employer’s providing the facility of child care they prove positively that they are concerned about the family of their employees as much as they are concerned about their employees. This feeling of togetherness and community ownership helps in retaining the employees to a large extent. Whenever you ask any candidate, for them family is their first priority. By providing the services of child care center the company assures that they shall have an excellent workflow from their employees providing best performance and output in the company than their competitors. At the end you will have fully satisfied employees who gave their best. It has been seen worldwide and various surveys have also proved that if an employee is tension free and if their needs are taken care of then – their productivity increases.As per the survey conducted in 2007, The employers who have been providing the services of childcare at workplace have better motivated employees and their turnover has seen a drastic change. The employees have better concentration on their work and excellent productivity. The studies have also proved that they remain stress free and they are not at all worried about their children – the reason being they need not hunt around to find a good childcare center. They can have their children in very close proximity and take care of their needs personally as and when required. Most of the working parents are aware that it is very hard and difficult to find a proper and reliable childcare service. It takes time for the parents to find a good center – they ensure that the child is taken care of properly. But with the advent of childcare facilities at the workplace there have been a great difference. Those employees who are provided the facility of childcare at their workplace have always opted to remain with the organization for a longer period of time. According to one of the surveys more than 23% of parents have turned down excellent offers – only because the company is not offering childcare facility. So you can understand the gravity of this issue. Today’s world is a place where people have to toil diligently in order to lead a good life. In this race most of the times the parents are not able to take care of their children properly – so if a childcare center is present at their workplace it gives better emotional security. When the children are near to them they feel less of anxiety and in case of any problems they can be immediately contacted to. They check about the needs of the children during the lunch breaks or whenever their workload is less. They can also keep a check as to how the person appointed is taking care of their child. When we list down the benefits of having a childcare at the workplace – you should understand that there are various disadvantages to this facility. This is like every coin has two sides – hence when you look at the benefits you should also see what would be the problems that could come up because of having a childcare center at the workplace. These disadvantages will help you take proper decision as to whether you need to keep the child in the childcare at the workplace. When a childcare facility is offered at the workplace – it is offered by the assumption that it is for one child. But the employees can have one, two, three children – now if a person having three children gets more benefits as compared to the person having one child – then it seem to be discrimination among the employees. This also affects in the work – there is a friction which is created in the team. This could bring down the performance of the employee. Here the management will have to make proper policies so that no employee is mentally tortured. When a company decides to start the childcare center at the workplace – there are many legal formalities to be completed. Once these formalities are completed they have to take care about the child in a proper manner. There are cases where the child has fallen down and they may be injured. In such situations the company has to spend for the treatment of the child. The company is potentially liable for all such expenses. This type of litigation expenses could prove to be a large burden in the long run. Hence the company should be ready to bear such expenses and proper budget has to be allotted for the same – so that there are no problems in the future. When the parents are with their children – most of the time – it reduces the difference between the personal life and professional life of the parents. Since they are always with their children their work is distracted very often. When they are in meeting they would always have in their back of the mind what is the state of their child. For e.g. when a project with a deadline is given to them they would think about their child who was not well that morning. Besides this the employees would like to spend their free time with their children rather than being with the fellow colleagues. This creates more of social barriers. Every jurisdiction has specific rules which are to be followed in order to start the childcare at the workplace. It is not just a matter of having a building and a person to take care of the children. Besides this the company should have proper infrastructure in order keep the children in a healthy scenario. The centers should have proper neat and clean bathrooms. They should also have proper safety equipment and that too in working order. But if the staff is not proper then they might take care of such logistics which could be life threatening threat to the children. There are all chances that there could be dilution in the services. Hence the company should issue licenses only to authorized persons. At the end, having a childcare center at the workplace is very vital for the betterment of the employees. If the company is able to provide such facility they can retain their employees for a longer period of time. It is becoming vital to have such facilities since both the parents are working and they want their children to grow up in the right manner. Having a childcare at the workplace makes them secure emotionally and they can perform better in their jobs since they are not worried about their children. 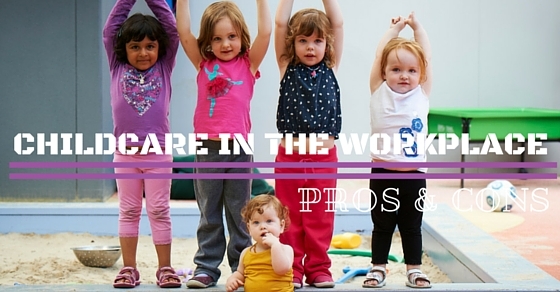 These pros and cons are just an overview about whether you should go for a childcare option or not. In the end finally you are the one who has to take a decision as to why you have to keep your child in the childcare at the workplace.